The Bounder 35K is a vehicle that essentially serves as the benchmark for affordable class A touring machines. For Fleetwood RV fans, the Bounder line has always exemplified the ideal combination of features, value, and family fun. Built to tour for a week without relying on external hookups or supplies, the gasoline powered Bounder class A motorhomes are fully equipped to deliver the freedom of the open road. 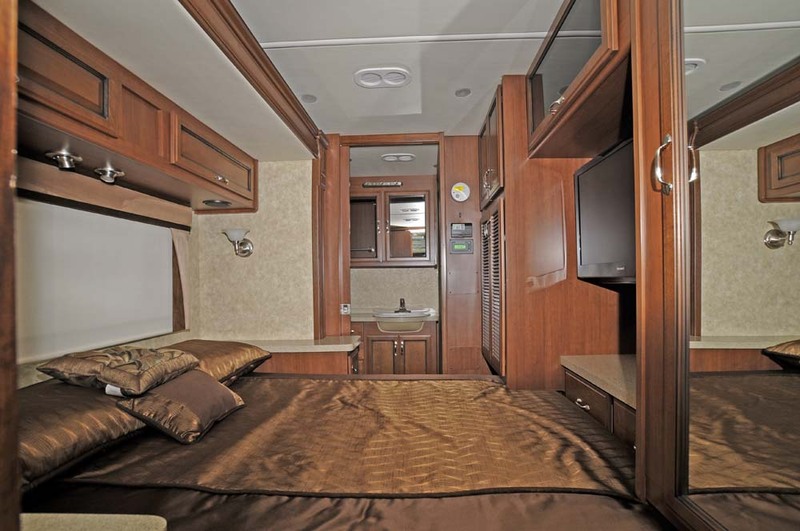 For 2013 Fleetwood RV offers three Bounder models – 33C, 35K, and 36E, starting in the $130,900 range, and five Bounder Classic models from 30 – 36 feet, starting at $106,000. We visited Sicard RV in Smithville, Ontario, to test drive the Bounder 35K, a vehicle that essentially serves as the benchmark for affordable class A touring machines. The Bounder 35K is built on a Ford chassis, powered by the 362 H.P. 6.8L Triton V10 gasoline engine. The Triton engine develops 457 lb-ft of torque at 3,250 RPM, and transmits this power to the pavement through a 5-speed automatic transmission with overdrive. While the front engine roars a bit when accelerating to cruising speed, the Bounder delivers a relatively quiet ride and a range of 800 – 1000 miles per 80 gallon fill-up (that is 10 MPG US or 23.5 l/100km to 12.5 MPG US or 18.8 l/100km), depending on road conditions and your driving style. The furnishings throughout the Bounder are of excellent quality and tastefully integrate into the overall appeal of the vehicle. Slip behind the wheel and you have a wonderful view of the road, with all of the controls and instrumentation within easy access. Driver and navigator cruise in comfort in reclining captain’s chairs that have full slide controls. Your in-dash systems include AM/FM radio with CD, satellite radio ready, and a colour rear and turn signal vision system. Your automotive A/C and heating system is familiar and easy to use, as is the cruise control, intermittent wiper switch, and tilt steering wheel. The Bounder comes with standard sun visors, and there is an optional power front shade that is very convenient. Tucked into the passenger side of the soft-surface automotive dash you will find a very convenient tray that serves as a laptop work station. Under the tray is a shallow drawer for your notepad, pencils, and maps. The passenger chair has a very comfortable footrest – a welcome addition to the design. 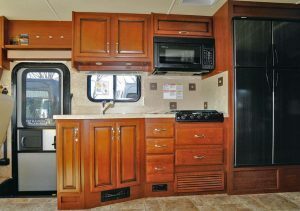 The galley comes with a 12 cubic-foot Dometic four door refrigerator, 3-burner cook-top, microwave and convection oven. To the left of the driver you have a bank of switches to operate the auxiliary start circuit, dash fans, and battery disconnect switch. A small but efficient snack tray is placed on the lowprofile engine cover. You can opt for a 32” LCD TV in the front overhead cabinet, or use the overhead cabinets for your travelling equipment. 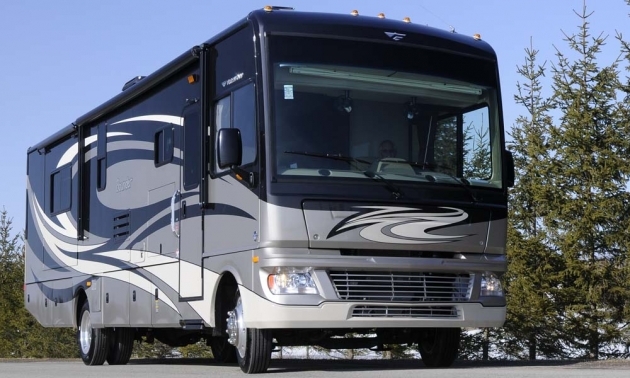 While the Bounder’s standard suspension provides very good ride and handling, in order to maximize fuel efficiency, the 2013 chassis is lighter than previous models, and serious RV travellers might want to opt for suspension and steering stabilization upgrades. Your RV dealer can advise you on these options. Fleetwood RV builds the Bounder on their patented Power Platform®, an ultra-strong chassis with generous passthrough under-floor storage space, heated and enclosed holding tanks, and molded polyethylene storage compartment liners. The Bounder features interlocking ceiling-to-sidewall construction to maintain the structural integrity of the RV component of the vehicle. 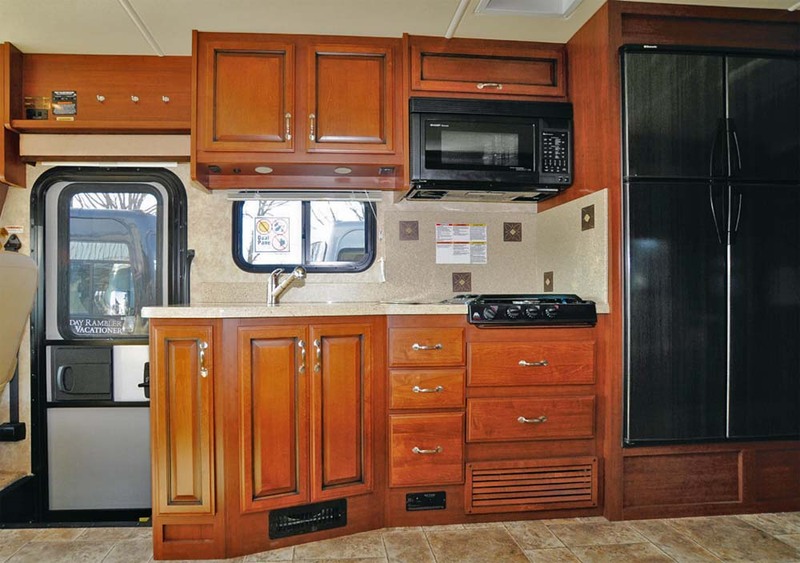 This assures proper fit of all cabinets and adds to the durability of the motorhome. Interlocking floor-to-sidewall construction seals out road noise, dust, and moisture while contributing to a quiet ride – the only squeaks and rattles on board the Bounder would come from your cargo. The sidewalls, floor, and ceiling of the Bounder are vacu-bonded to a metal frame to enhance durability and create a strong, weather-resistant structure. 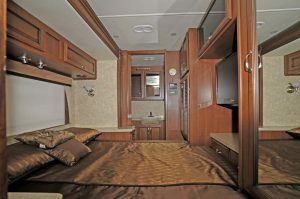 We were impressed with the way that Fleetwood RV has enhanced the interior décor and appointments of the 2013 Bounder, compared to the touring models of previous eras. While the traditional Bounder was functional, the new Bounder is both functional and elegant – interior cabinetry and furnishings are excellent quality and tastefully integrated into the overall visual appeal of the vehicle. Raised panel cabinet doors throughout the vehicle are available in toasted chestnut or butterscotch spice finish. The ceiling is finished in a softtouch vinyl, with recessed lighting halogen throughout the coach, and you can order optional day/night double roller shades for the windows. We were impressed with the interior décor and appointments of the 35 Bounder. 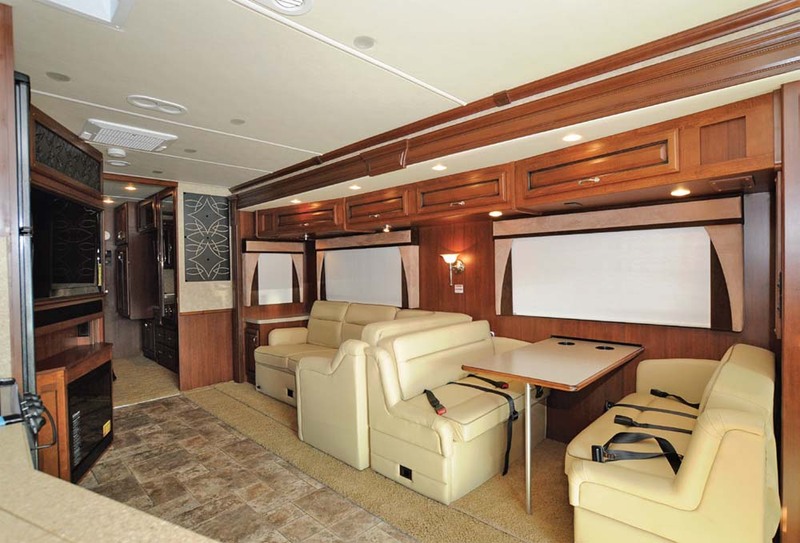 The Bounder 35K floor plan is a very interesting combination of four distinct concepts. In the cockpit, the driver and navigator ride in supreme comfort, with all of the modern RV conveniences, but none of the distractions that have become common in the automotive industry. Just aft of the cockpit is the galley and dinette area, with a dinette and pantry in the front of the large driver’s side slide-out section. You can select a facing dinette or a freestanding dinette with credenza. The rear portion of the slide is dedicated to an L-shape sofa, facing a 40” LCD HD TV, and one of the largest refrigerators that we have seen in an RV of this type. The DVD home theatre system has stereo sound that will knock the socks off your visitors. The standard roof-mount antenna has a signal booster, and you can upgrade to the optional DSS Auto Seek satellite dome for a full range of programming. You can also upgrade to a Blu-Ray® home theatre sound system. Our test vehicle sported the Bounder Sahara Moon exterior décor paint. Mounting the TV on an angle gives the guest bathroom a unique shape, with plenty of legroom and space for a stylish vanity. The bathroom entrance is adjacent to the rear bedroom entrance, providing privacy and a sense of separation from the lounge area. The optional electric fireplace adds a nice touch. 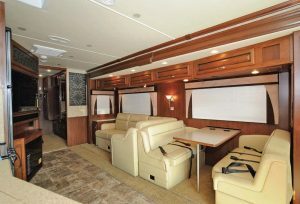 The master bedroom suite can be partitioned from the lounge and dinette area by a solid sliding door – it is an ideal arrangement that addresses all of the elements of a serious touring motorhome – driving, dining, entertainment, and equipped with a accommodations. The Bounder galley is well-planned and fully equipped, with a 12 cubicfoot Dometic four-door refrigerator that would be at home in any luxury condo. The galley also includes a 3-burner cooktop, microwave convection oven, and large double stainless steel sink. You can upgrade to an optional 3-burner range with oven. A Fan-Tastic® power roof vent in the galley area handles cooking steam and odours. The Bounder carries 85 gallons of fresh water, and features a whole-coach water filtration system and PEX plumbing throughout the vehicle. The 10-gallon gas/ electric quick recovery water heater with DSI has a bypass valve for your convenience, and there are water pump switches in the galley and in both washrooms. We really like the use of adjustable shelves in some of the galley cabinets, and the solid surface backsplash. The single lever galley faucet has a pull-out sprayer, just like residential models, and there are sink covers that double as cutting boards to maximize your food preparation space. There are large drawers under the dinette to supplement the array of drawers and cupboards in the galley area. All of the drawers feature deluxe roller bearing, full-extension drawer guides and transit-ship locks. Every aspect of this motorhome is designed to provide a safe and enjoyable RV experience. From the 30” wide entry door with assist handle to the full array of carbon monoxide, propane and smoke detectors, passenger safety is a key factor in the vehicle. There are multiple seating locations with safety belts, and a child seat tether. The Bounder 35K is a large motorhome, with systems equipped to handle long journeys. The 34,000 BTU furnace keeps the interior comfortable on cold days, and the dual high-efficiency roof A/C units are equipped with solar panel, heat pump, and “Chill Grills”. With a full range of appliances and the operational assignment to fill the needs of a long-range touring vehicle, the Bounder comes equipped with a 1,200 watt inverter and a 120V/12V AC/ DC converter. There is an energy management system to control all of the 12V and 120V appliances. The coach has dual 6V deep-cycle house batteries, a battery disconnect switch and an auxiliary start system. 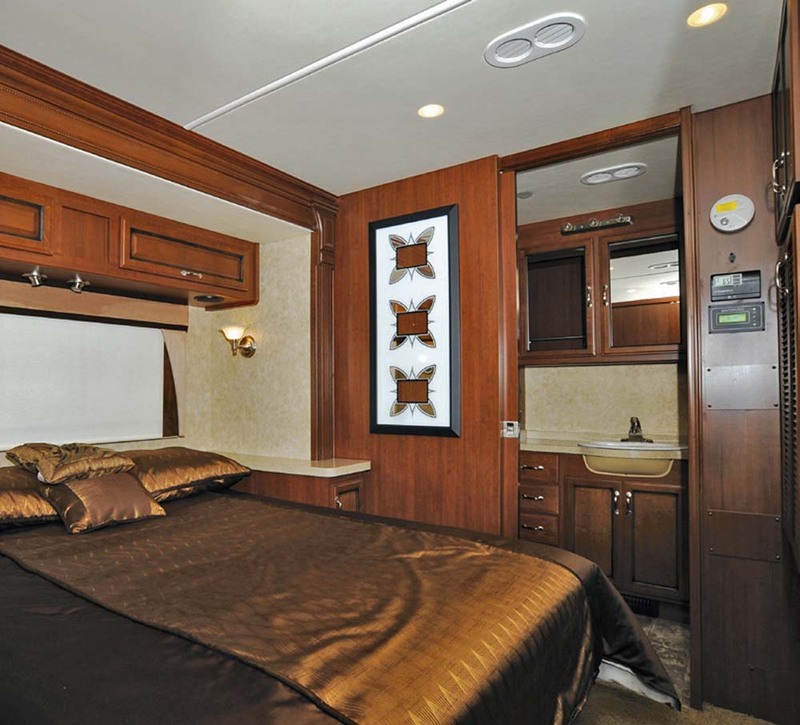 The master bedroom in the Bounder 35K features a queen-size bed with Restonic innerspring mattress. The vehicle comes with bedspread and décor pillows, pleated shades, and decorative wall hangings. The headboard of the bed is nestled into a passenger-side slideout. With the slide retracted, the foot of the bed fits under the cabinets on the driver’s side of the vehicle – you literally have to climb over the bed to reach the rear bathroom. With the slide extended, however, you have full access to the rear bathroom and full access to the closets and vanity on the wall opposite the foot of the bed. In the overall perspective, this floor plan works well and it provides access to the twin wardrobes, one of the wardrobes can accommodate an optional washer/dryer pair. The master bedroom has a queen-size bed with a bedspread and décor pillows. There’s also pleated shades and wall hangings. In the centre of the bedroom wardrobe array, there is a vanity that accommodates a 32” LCD TV, and the rear stereo speakers fill the area with sound. You can close the sliding door for privacy and enjoy a private suite. Torque windows and ducted heat and A/C assure your comfort. You and your guests will find the washrooms in the Bounder to be wellequipped with residential style fixtures. The ensuite bathroom features a glass shower enclosure with a skylight and a lower step threshold. A molded tub/ shower enclosure is easy to clean. The porcelain toilet has a water saver feature, and the tank has a San-T-Flush® system. A skylight above the shower provides natural light and a Fan- Tastic® power roof vent with wall switch keeps the area cool. Hardwood bath doors and trim add to the décor in this area. The Bounder offers a full range of standard and optional external features that transform the campsite into an extension of your RV facilities. The standard 17’ awning can be upgraded to a powered model that extends and retracts at the touch of a switch. You can select an optional exterior entertainment centre, and you can order power levelling jacks. All of the Bounder hookups are conveniently located within the storage compartments on the driver’s side of the vehicle, and each area is equipped with convenience lighting for late-night arrivals. For comfort, convenience, and family fun in a gasoline powered class A motorhome that is designed to tour, the Bounder remains the benchmark for the industry.